Difference Between Matte and Glossy: Which Should You Choose for a Planner? When it comes to printing a planner, there are pros and cons to using matte and glossy prints. You want to create the best planner possible that will leave an impression on the reader, so you need to choose the printing method that you feel will suit your work the most. So, that’s why you need to look at both sides of the argument - matte and glossy. This post will outline everything you need to know when it comes to choosing what material to use for your planner. It will also highlight the key differences between matte and glossy. Matte paper is regular-based paper that’s covered with a thin layer of inkjet receiving coating. This coating means that every drop of ink that comes from the inkjet printer is received properly which makes for an exceptional, professional finish. Dependant on the weights and ink absorption, matte papers can either be affordable or pretty expensive. It can still produce brilliant results for your planner. However, there are both pros and cons to printing with matte paper. Matte paper is versatile when it comes to printing and is compatible with both inkjet and laser printers due to the absence of a thick, shiny coated layer. Matte can make your planner look slick and modern, it’s very on trend. It dries quickly and resists fingerprints. Therefore, the quality remains true and the risk of accidentally smudging and ruining the planner is minimal. Planners produced on matte paper can be easily written in with any pen or pencil. It’s inexpensive and is suitable for the majority of printed projects. Due to the lack of thick coating and protective layer, printed products on matte paper could be more prone to creasing and bending. Unless you use professional matte paper (as opposed to regular), the longevity of your project and productions won’t be great. Glossy finishes are popular for planners. Although it’s not the best stock when it comes to writing on, the paper has a thick, shiny coating on it to make it really stand out. Results on glossy paper look ultra professional too. Gives your work an ultra smooth finish which makes it satisfying to hold. Therefore, it’s more likely that people will engage with it. Photos appear to be very impressive when printed on glossy paper. They really jump out of the paper and are visually striking. It can add that professional finishing touch to your work. Glossy paper creates glare, which means that your planner may be hard to read under certain lights at events or in classrooms. Glossy finishes can prove to be tough to write on at times, which obviously isn’t ideal for planners. The main difference between the two is the contrasting finish you see from printed products on either. A glossy finish will come with an ultra-smooth, shiny appearance. It’s also very colour rich and vibrant. Whereas matte paper gives off a duller, more subtle finish. Therefore, the content and images on a glossy finish will strike the audience more effectively. The feel and the quality difference between the two are complete contrasts also. A glossy planner usually feels more satisfying to hold, due to its ultra-smooth feel. And the quality of images will also be superior on glossy paper too. As we mentioned earlier, there is no right or wrong answer to the right choice of stock for your planner. After all, it’s your product so you can choose to produce it how you like. The best approach would be to use a combination of both matte and glossy, depending on the content that will be on that page. For example, a glossy stock would be great for the covers and image-heavy sections. This will make these sections more visually striking. But, use matte for pages that need to be written on, as it’s easier to write on. Pen ink will dry quickly so you don’t have to worry about smudging your work or notes. If your students are constantly smudging their work, they’re unlikely to enjoy writing in their planner so probably won’t use it and may not be as organised as they could be. If you're looking for the difference between Matte and Uncoated, click here. Here’s an example of a planner we produced for the College of Optometrists in London. 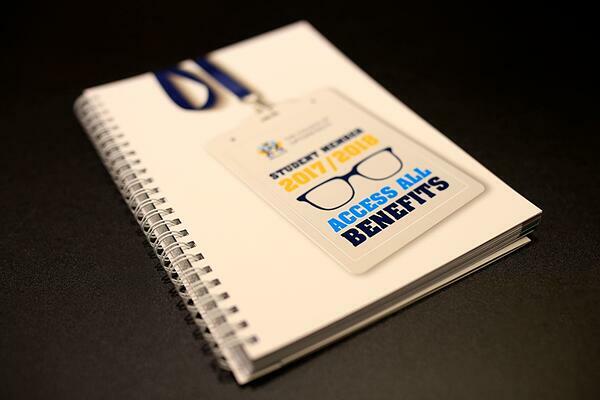 The planner was an A5 portrait size and was finished off with a glossy laminate to enhance the look and feel of it. An all-round brilliant job. The diary was handed out to all students for the academic year and will be staying with them throughout to remind them of their commitments. It’s a really useful aid. From a print perspective, it uses LED UV print on uncoated materials giving a vibrant, modern look with good use of images which makes this more engaging and more likely to be used for a longer period. As a celebration of our success in early 2018 coinciding with our 60th anniversary, we’ve put together a special pack of our favourite jobs of this year. This pack will showcase our best work and exactly what we’re good at. If you’d like to see more and potentially how we can help your business, download it for free below and start browsing.